All the characters in a novel need to have names. Generally speaking they need to have names that readers will recognise as names and be able to pronounce. For minor characters it might be possible to get away with labels (the guard, the governor, the nurse) but for your main characters a real name is essential. As I’ve mentioned before, names are handles which allow readers – but also the writer – to get a grip on a character. They are also boxes that contain information about the character. Some of this information will derive from the name itself, but most you will add when you introduce the character and as you develop the story and give the character room to act. If you’ve done this successfully, when your character’s name comes up further on in the story your reader will associate a whole slew of information with the character which you won’t need to repeat. So choosing names for your characters – especially for your key characters – is important. Sometimes names come very easily, sometimes it takes a long time to find them. Last week, my fellow Blogg52er Anna Hellqvist took up this issue. She described how long it took her to find the name of one of her characters. I’ve had a similar problem. In the first part of Elin’s Story I decided I needed an extra point-of-view character. This would be someone a bit older than Elin, and a bit more knowing. This person would offer an alternative perspective on events that otherwise come mediated through Elin. And I wanted someone who could provide a critical view of Elin herself. In order to have the character share Elin’s experiences I had to make her female with a similar social status. As my historical novel’s cast of characters includes “real” people, I already have a list of names I have to use. This is both an advantage and a bit of a straitjacket. The historical Elin travelled from Sweden to England in the “family” of Princess Cecilia. (That’s is how the sources describe the group of people around Cecilia – her family.) The names of almost all the family are in the historical record. Arriving in London the Princess and her women made an impression and are described – at least, their dresses are described – by eyewitnesses. The Princess had six maids. Elin was one and four of the others are named, but it was the unnamed sixth that caught my eye. She would be my extra p.o.v. character. I already had an idea of her personality. I had decided she resembled the character of Becky Sharp in William Thackeray’s Vanity Fair. Becky is a subsidiary character and not a particularly attractive one, but she is very astute. Very sharp in fact. (And so we see Thackeray also choosing his characters’ names with care.) Many people find Becky more memorable than Vanity Fair’s principal female character, Amelia. Obviously I don’t want to create a subsidiary character that is more engaging than Elin, but I do want some of Becky’s acidity. My first thought was to call my character Rebecca. Lazy. Besides, a bit of research showed me this name did not become common as a Christian name until the 1600s. 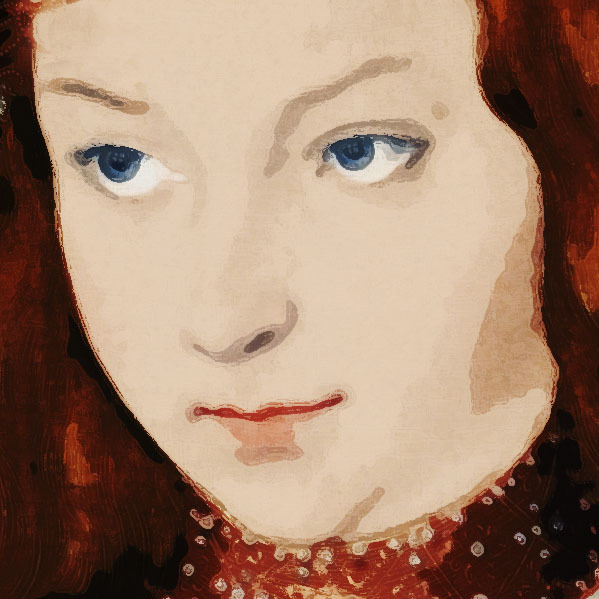 My novel is set in the middle of the 1500s and this character had to have been born in the 1540s. My back story for her gives her an uncertain ancestry, but not a Jewish ancestry. Rebecca was simply not possible. Popular Swedish women’s names of the period were Kristina, Anna, Margarita, Birgitta and their variants. Among the Princess’s women I already had two Kristinas, one Anna and one Brita (Birgitta ). I could have gone for something more exotic – I considered a Polish name or a Dutch name – but eventually I decided I needed a name that was plausible and did not draw attention to itself. I settled on Johanna. Johanna has a similar biblical quality to Rebecca but is a possible Christian name in the period, perhaps especially in Germany. It wasn’t too far removed from Anna but far enough for there not to be a confusion. (I was already trying to find a way of distinguishing the two Kristinas. I didn’t want to go out of my way to create a second, similar problem.) So Johanna it was, and she has grown into her name very nicely. Johanna is an orphan. She was a ward of the court of King Sigismund of Poland and placed by the King as a maid to his sister Katarina. This is the Princess known to Swedish history as Katarina Jagellonica. In 1562 Katarina married Johan, Duke of Finland, Princess Cecilia’s brother and King Erik XIV’s half-brother. After her wedding, Katarina took her women with her when she moved to the Duke’s palace at Åbo. Following Duke Johan’s arrest and imprisonment for treason against King Erik XIV in 1563, Princess Katarina was interned with him. Her entourage was forcibly reduced. Some women were sent home to Poland, others were “redistributed”. Johanna was added to Princess Cecilia’s court. Johanna’s father was a mercenary who fought for various German princes before taking service with King Sigismund in Poland. Johanna claims he was a descendant of the Norse Earls of Orkney. This means she can also reasonably follow Scandinavian practice. She calls herself Jarlsdotter. But I’m still not done. Johanna Jarlsdotter also needs a family name. Even though 16th century Swedish aristocrats commonly used only their first names and patronyms, they were still very conscious of their membership of certain families. Family relationships were the social networks of the age – a source of pride, assurance, influence and aid. Princess Cecilia, for instance, was very proud of her family name, Vasa. As for Elin, she probably described herself as a Bååt. When Ulf Henriksson died leaving his wife Agnes Knutsdotter to take care of six children under the age of 18 – and four of them girls – Agnes fell back on the family connections. Herself, she was a member of the Lillie family. Ulf had been a Bååt. It was almost certainly through these connections that Agnes was able to place Elin as a maid at Princess Cecilia’s court. Johanna has no family connections in Sweden, she cannot call on her family for help but must live by her wits. However, she must still have a family name to be proud of and use it from time to time to underline her claim to be an aristocrat. Having been thwarted in my original plan to link Johanna’s character to Becky Sharp using the same first name, I decided to explore the possibility of giving her a kind of familial connection instead. I decided that Johanna’s family name would be some variant on sharp. One modern Swedish word for sharp is vass (it can also mean reed), in Icelandic and Faroese – the two languages closest to Norn, the dialect of Orkney – I find hvass, hvassi and vassur. I decided to make Johanna a member of the Vassi family. Vassi seems just about possible as a family name (though I’ve not been able to find it anywhere). It also seems a bit made up. I think it suits Johanna. And so, I present to you Johanna Jarlsdotter Vassi. The illustrations on this page started life as the 1525/1526 portrait of Sibylle von Cleve als Braut by Lucas Cranach the elder reproduced from the copy on Wikimedia. I originally published this article on the separate At the Quill website. I revised it for spelling and punctuation, carried out some SEO fine-tuning, and added a featured image before transferring it here on 12 April 2017.